During the month of February, all students in St. Charles played a part in our Read Olympics! Each class was teamed up with 1 or 2 other classes to track how many minutes they could read at home throughout the month. The students had a great time watching their team’s points, recorded on our Read-O-Meter poster in the front entrance of the school, get higher and higher. All students were reaching for the gold! It was a close call. Congratulations to the Red Team, (Kindergarten A, Gr. 3-4, Gr. 5L), who never stopped reading! Way to go students! Students also had a chance to fill their reading log with entries to win a free Kids Meal at Boston Pizza! Enjoy! Students al so enjoyed D.E.A.R – Drop Everything and Read. Whether they were in Music, Gym or Science. they stopped what they were doing, grabbed a book and read for 10 minutes. Their favorite was FLASHLIGHT FRIDAYS. 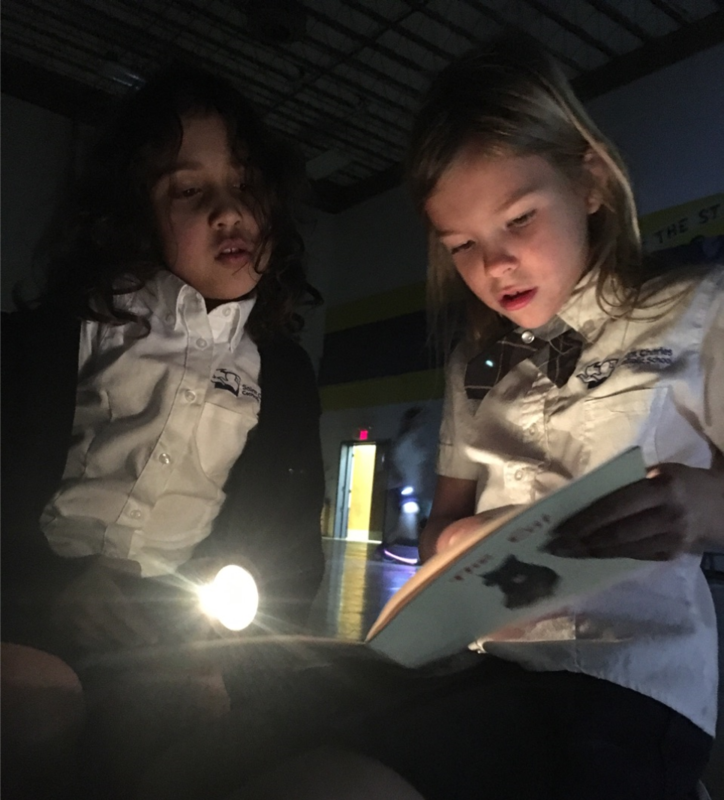 They would turn out the lights and read their book using their flashlights! What fun! Even the teachers played along! St. Charles staff also had their pictures up by the office which showed them reading their favorite books. Each picture only showed staff member’s eyes. I hope you had a chance to figure out who was who!